GANI & SONS was established more than 100 (One Hundred) Years ago in the Year 1909. 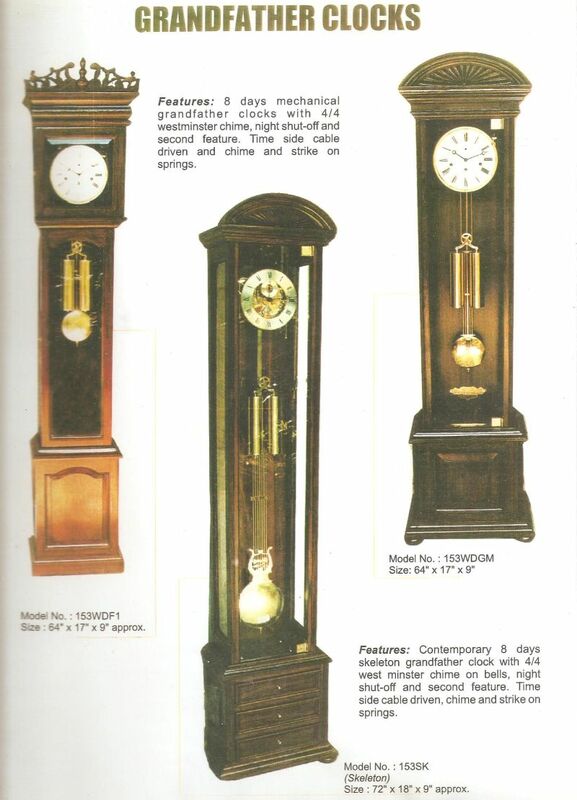 Today in 2012 we offer you an unmatched range of - floor standing - Grandfather Clocks. Firstly we have �adonis� the battery operated Quartz range where the cabinet is made wholly in India in 4 basic models, 2 in the Economy Range priced at Rs.27,500/- basically before taxes, then 2 other models costing Rs. 29,500/- basically. Whilst the cabinets are Indian, the movements are imported. 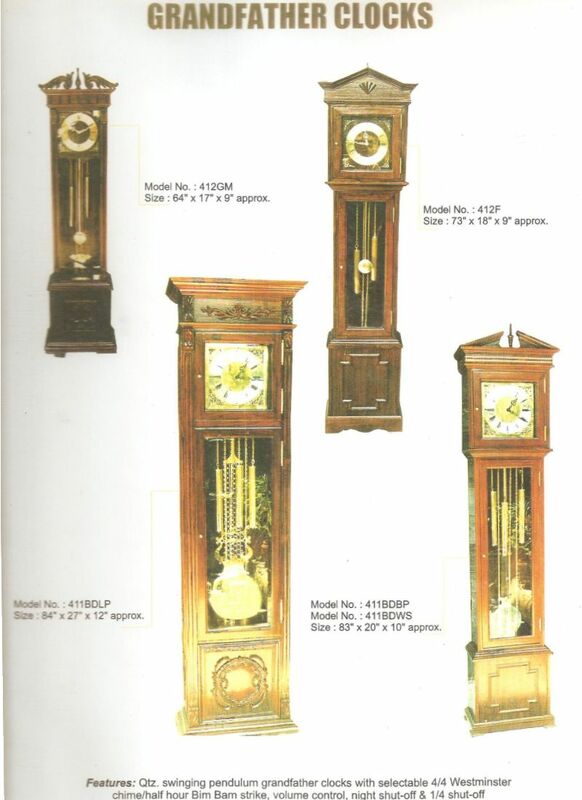 Secondly there are the Grandfather Chiming Clocks where the cabinets are made in India from real teakwood with imported German 8 day Chiming Mechanisms. The price range is Rs.1,19,000/- to about Rs.3,00,000/- basically. Whilst the cabinets are made from teakwood they can be stained to Mahogany, Rosewood, Natural Teak finish, Walnut, etc. Making a Grandfather Clock in real rosewood today would be prohibitively expensive and orders are not usually undertaken as it takes a few months to make and deliver..
Then there are German mechanisms with Bim Bam Striking (no chiming) where prices start from Rs.1,19,000/- onwards. Some of these Grandfather Clocks have Quartz (German) movements and are cased in well crafted marine plywood cabinets nicely veneered. And then again some are just plain Wall Clocks with and without pendulums with full Chiming & Striking. All these type of Clocks are made to order only and may take about 6-8 weeks for delivery. See technical details below. Finally, we have the fully imported Grandfather Clocks from Black Forest, Germany which rates start from above Rs.3,00,000/- basically, for full Chiming Clocks with Moon phase and they go up and up. Here we have 2 Brands, AMS & HERMLE, on offer. In the 100% imported category HERMLE NA Clocks are more attractively priced � starting at about USD 4000.- which have the traditional HERMLE mechanical Movements with exquisite cabinets made in America. Then there are the world famous handcrafted Cuckoo Clocks made in the black forest area in Germany available in both quartz & mechanical versions. These too are fully imported. 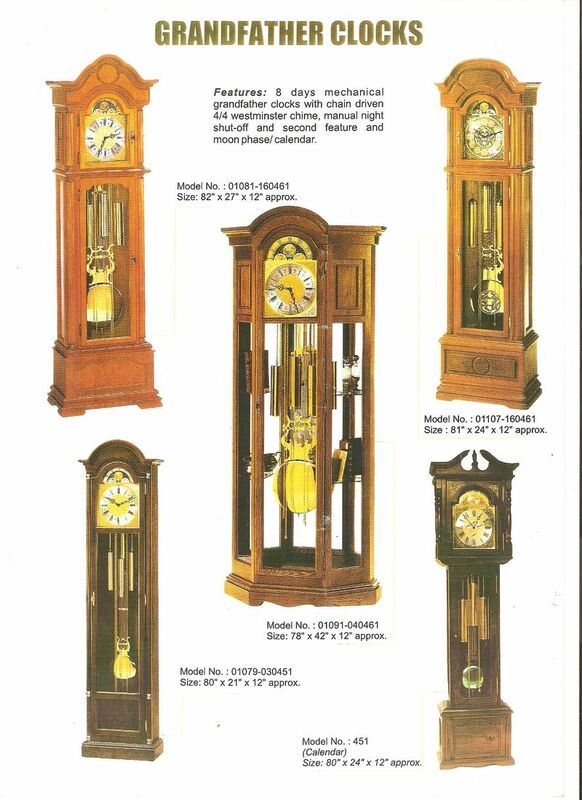 Prices for any type of Grandfather Clock / Cuckoo Clock are available on request. If you need any further information, please contact Mr.M.M.J.Namazi on Phone number: +91 - 044 � 2535 3246 or Mobile: +91 95000 01909 or email: grandfatherclocks@ganiandsons.com or just simply drop in to our showroom (in between Central Railway Station & Parrys Corner) in Park Town. All prices mentioned above are FOB Chennai. VAT being extra, always. 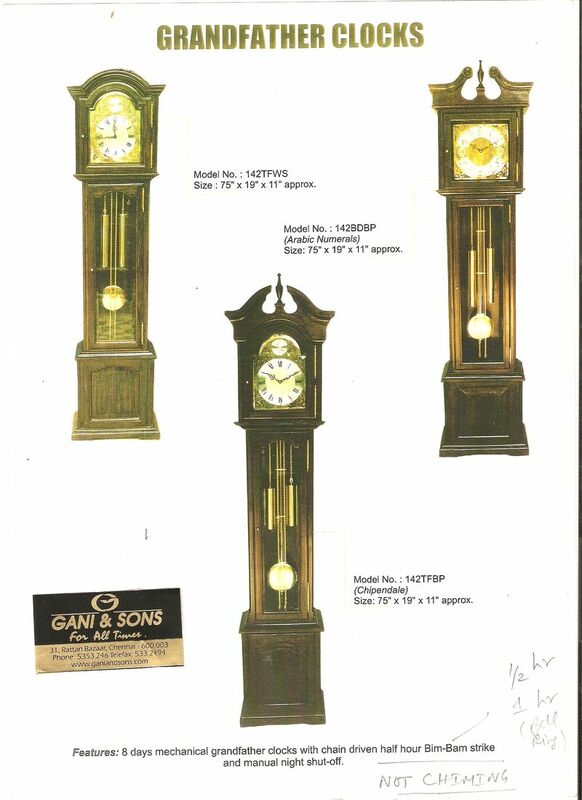 Needless to say that whether you chose from the First, Second or Third range, All Grandfather Clocks sold by GANI & SONS carry a One Year Guarantee. ADONIS �super value for money� Quartz GRAND FATHER CLOCKS are made basically in 4 models. Then we have the 2 Economy models too. Model nos. E 1717 is an Economy Models, whose cabinet is 6 feet tall and Chime & Strike on the 1/4 Hour & the Hour Only. Price Rs.27,500/- basically before taxes for either model. Installation in Chennai City limits is Free of Cost however for Outstation Orders we charge (about) Rs.1,000/- Extra which includes carton in a crate Packing. Freight is extra (at actuals) for a home delivery. Model no. E 2727 retails at Rs.22,800/- basically. Model nos. 5757 & 9797 are full fledged Quarter Chime models which Chime every 15 minutes and Strike the hours every hour. Both these models cost Rs. 27,500/- basically and their cabinets are 7 feet tall. Here again Installation in Chennai City limits is Free and for Outstation Orders we charge Extra. 2 special models in this �adonis� range are : 6767 & 7777. 6767 is a model with a pointed back which fits perfectly into a corner of any room at 90 degrees and is space saving. For all other practical purposes it resembles a 9797 model and is priced slightly higer than the 9797. The 7777 is a 6 feet cabinet with carvings on the side panels and costs basically the same Rs.29,500/- only. Design Details of Model nos. E1717, E 2727, 5757 & 9797. 6767 & 7777 also. Model 9797 is the Grandfather Clock with the cabinet having the classic broken arch design on top of the dial and an arched door top. They also have 3 weights like hangings at the back of the case just for ornamental value. Model 5757 is the Grandfather Clock with the three spikes on top. This model also incorporates 3 weights like hangings at the back of the case just for ornamental value. Economy Model no. 2727 Is a New Model with a curved simple arched top. Model no. 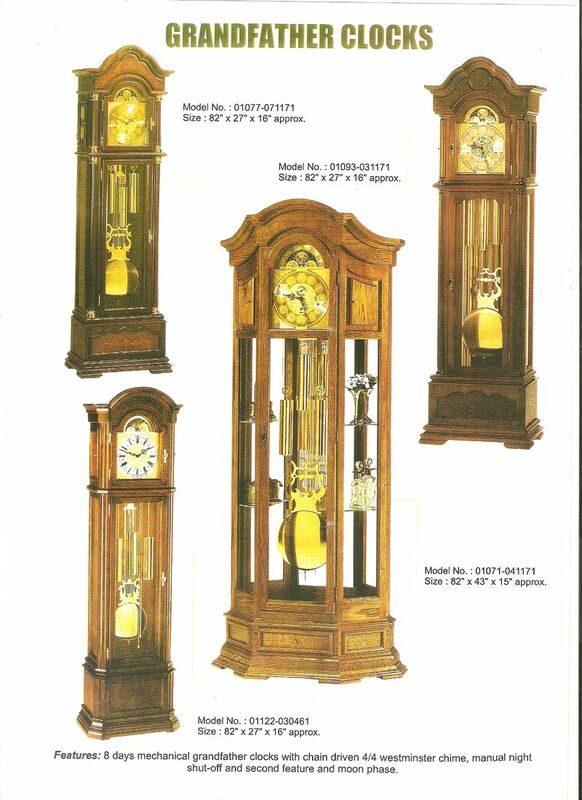 7777 is a shorter version (only 71 inches high) of Grandfather Clock again with the classic broken arch on top of the cabinet but it also has carvings (see close up photo) on the side panels and also a full fluted pillar design on either side of the front of the cabinet. 6767 (Corner Clock). This model is made with a pointed back, so as to fit in to a corner of a room (please see the top view in the printed image). All these 4 (+2) models (1717, 2727, 5757, 9797, 6767 & 7777) have 2 user selectable Chimes which are Westminster & Whittington and have auto night shut off facility whose clock (timing) movements (SKP) are imported and the mechanism, pendulum & striking are all run on 4 nos. (pen torch) dry cells only. The Chiming & Striking Movement is imported as well as the Dial & the lyre shaped separate swing Pendulum. Just like seeing is believing, hearing is believing. You have to hear the Chiming Sound of the imported SKP Movement - from the SEIKO stables - to understand the beautiful audio chimes & striking which sound like real gongs of any adonis Grandfather Clock. Please call over at our showroom for a demo. The cabinets are made a combination of mdf and pine wood with a plywood back, crafted very much in India and stained with a melamine finish to 5 standard basic colours like Rosewood, Teakwood, Walnut, Cherry & Black both in glossy and matt finishes. The dial is imported from Taiwan and the case in made in India. The standard staining / finishes that we give is WALNUT, TEAK, ROSEWOOD, CHERRY & BLACK. All finishes are melamine coated. Please specify the colours of the staining whilst ordering. If any particular colour is not available another colour will be supplied unless one is willing to wait for about 40-50 days for a specific colour that is not in stock. We therefore request a first, secong and third choice of colours while ordering. The wooden Cabinets are made of 3 pieces and is very easily assembled together (just by 2 long screws to each section which can be turned by the hand). All the 4 models have Quarter Chime (imported) Movements playing out the Westminster Chimes (& another user selectable tune) every 15 minutes and the striking of the hours every Hour. There is a volume control knob and all adonis Grandfather Clocks have an auto night shut off feature. The rich (real gong like) tone of the Westminster Chimes and the Striking of the Hours are simply superb and must be heard to be really appreciated. Please drop in to our showroom on any working day during working hours to see the various models on display. We normally have a few adonis (Quartz) Grandfather Clocks on display. All the Clocks have (imported) golden colour etched Dials Only with clearly legible Roman Numerals. The Movement (Mechanism) is quartz based and runs on 4 nos. Pentorch dry cells which are to be inserted at the back of the clock dial (and are supplied). The Pendulum is a separate swing Pendulum in all the models whilst the brass weights are decorative only in the larger models. Approximate dimensions of model no. 9797 :	Total Height about 7 feet (210 cm) Width: 18 inches and 45 cm depth at base. Shipping weight is about 50 KG. A Grandfather Clock is a floor standing clock. Modifications cannot be made to any model. You even do not need a screwdriver to set up / install and Start the ADONIS Grand Father Clock. Just fasten the 4 nos. long screws (with hex heads) inside the cabinet and of course put in the batteries and hand up the lyre shaped Pendulum. DELIVERY & PAYMENT : These clocks are usually in Stock and can be fully paid for 100% after which they will be despatched to the destination of your choice. If for any reason a particular model or colour is Not-in-Stock, then you need to book the same with a 50% Advance payment and the balance on delivery. It will be delivered in about 45-60 days at the maximum. Please do not confuse these Grandfather Clocks with cheap Chinese versions which are not guaranteed, All our Grandfather Clocks are 100% serviceable and carry a One Year Guarantee. TAXES: VAT @ 14.5% or as is statutorily applicable will always be extra. As with ALL products sold by us there is a ONE YEAR GUARANTEE on the ADONIS and ALL Other Grand Father Clocks from the date of supply, from all manufacturing defects.